When Tone It Up (TIU) hosted us in Southern California for its seaside retreat earlier this year, we got some amazing tips from its go-to makeup artist, Jennifer Naideth. Jennifer is a pro at creating the effortless, au naturel California beach babe look for TIU founders Karena and Katrina, as well as packing essentials for a gym bag, creating a post-workout quick makeup routine, and (our favorite) devising a quick fix to that red face most of us get after a hot and sweaty workout. While there’s nothing to worry about (your face turning red after exercise is totally normal! ), if you’re on your way to the office, a date, or even just brunch out with your friends, we get that you might want to cool that face off and return to your normal complexion. Fortunately, Jennifer has a few great tips on how to calm the redness. The cold towel face mask. This trick calls for cold water from the sink and any hand towel your gym or studio might provide. “Hold it on your face like a face mask for a few minutes,” said Jennifer. This should start to reduce some of the red hue. Cold shower and washcloth. Take the washcloth trick into the shower — a cold shower! This should help send the blood back, away from your face. So instead of taking your usual warm post-workout shower, cool it down, and bring the mask in with you. Use essential oils. Jennifer’s favorite tip is to apply essential oils to her face like “lavender, tangerine, peppermint, and wild citrus.” She noted that she’s fond of doTERRA essential oils and keeps them in her gym bag. Ice your neck. This tip is from our own experience — a pack of ice on the neck can start to cool the blood going to your face to reduce redness. We’ve tried it post-half-marathon, and it’s crazy how quickly your face goes from freakishly red to slightly flushed. If you don’t have ice, try a cold water bottle and put it onto the soft part of your neck where it meets your jaw bone (under your ear). Quinoa used to get all the attention as one of the most nutritious whole grains, hailed as one of the best superfoods ever, but farro is quickly gaining popularity. A little softer and more tender in texture, it’s similar to rice, so people who can’t deal with the slightly nutty flavor and poppy texture of quinoa will love spooning into a bowl of farro. But is it healthier than quinoa? Check out the nutritional comparison below. For those who deal with any sort of wheat intolerance, it’s important to note that farro is not a gluten-free grain. Are you surprised? Nutritionally speaking, both grains are pretty much exactly the same. While they’re both high in fiber and protein, farro has slightly more carbs but also offers more calcium than quinoa. 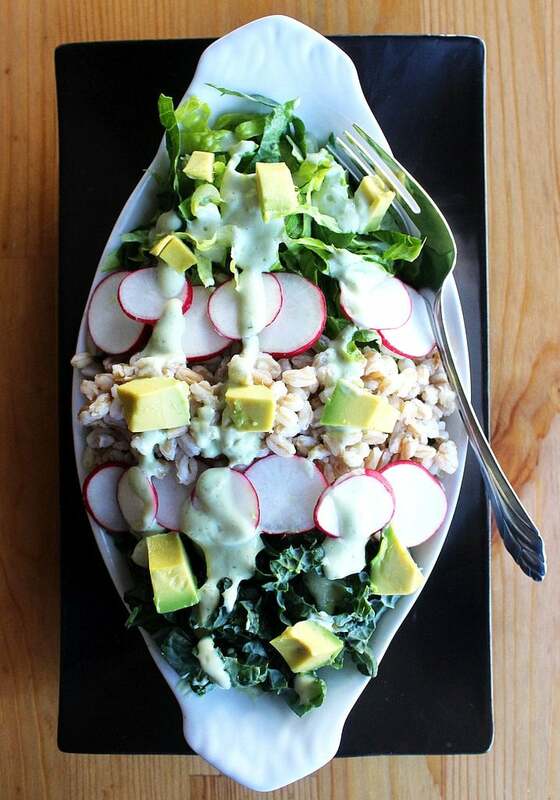 If you’re new to farro, try this radish, kale, and farro salad. Still obsessed with quinoa? Try it for the first meal of the day making this apple cinnamon breakfast bake. For an appetizer or dinner, whip up these Mexican quinoa burrito bites. And for dessert you’ll love these ginger molasses cookies made with homemade quinoa flour. Can’t choose between these two delicious grains? Whip up this Tender Greens’ Happy Vegan Salad that includes a quinoa and beet salad as well as a farro cranberry kale salad. Yum! Baking calms the mind and feeds the soul, but all that buttery goodness can pack on the pounds. 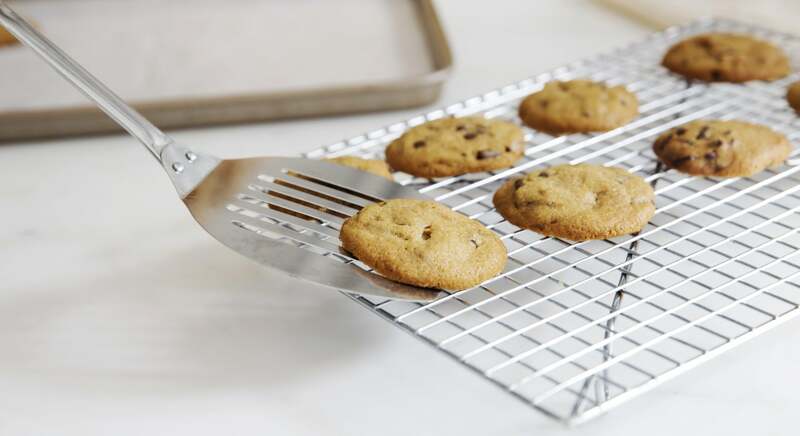 If you’re looking to make healthier baked goods, omitting some or all of the butter from your favorite recipes can greatly reduce the calories, fat, and cholesterol. There are countless ways to replace eggs in recipes, and here are healthier alternatives to using butter (great for vegan bakers, too). Applesauce: Often used to replace oil in recipes, applesauce can also be used as a butter alternative, and it works best in cake-like recipes (like this vegan banana apple chunk bread). Replace half the amount of butter in your recipe with applesauce; if the recipe calls for one cup of butter, use half a cup of butter and half a cup of applesauce. If you don’t mind a denser, more moist bread, replace all the butter with applesauce to cut even more calories and fat. Avocado: Substitute half the amount of butter in a baking recipe with mashed avocado (it works well with cookies and quick breads like these pumpkin apple muffins); use the same method as you would when using applesauce. Using avocado not only lowers the calorie content, but also creates a softer, moister baked good, and is perfect if you want to omit the dairy. You can also use avocado in place of butter to make vegan “buttercream” frosting. Earth Balance: Replace all the butter with Earth Balance to reduce saturated fat and cholesterol. Using Smart Balance rather than Earth Balance will also save some calories, and note that Original Smart Balance is now dairy-free! Greek yogurt: Replace half the amount of butter in your cookie recipes with half the amount of full-fat plain Greek yogurt. For example, if the recipe calls for one cup of butter, use half a cup of butter and one quarter cup of yogurt. You’ll reduce the calories and the saturated fat. Play around with using more yogurt and less butter to see if you still like the taste and consistency. Here are more ways to use Greek yogurt in baking recipes. If you’re avoiding dairy, use soy yogurt instead, like this recipe for protein banana bread. Prune purée: Often used to help little ones stay regular, prune purée also makes a low-calorie and low-fat alternative to butter. Whatever amount of butter the recipe calls for, replace it completely with store-bought baby food prune purée (unless you have time to make your own; just purée prunes in the food processor). This option works well in recipes that involve chocolate and cinnamon. Boxing can be integrated into various exercise genres including cardio, HIIT, plyometric, reflex training and stamina training. Reap the benefits of this all-rounder with Tiffanee Cook, Boxing Trainer from Fightfit Boxing Centre’s boxing basics. It is important that before starting a boxing workout, your body, joints and muscles are nice and warm. The best way to do this is a boxing-specific warm-up: e.g. shadow-boxing. When shadow-boxing, make sure you move around, keeping your boxing stance with light feet; remember to “float like a butterfly”. As you do this, throw punches such as jabs, crosses and hooks. Start slowly and pick up the pace and intensity as you feel your body warming up. Shadow-boxing/sparring is often done in front of a mirror, which enables you to check that your stance is on cue and hands are up. More advanced punches such as the rip and the upper cut require good timing and a strong core. Alternatively, visit https://www.youtube.com. Stand with feet approximately shoulder-width apart with your preferred back leg roughly 30 cm back. Keep light on your feet with your back heel off the ground to help you float around the bag/ring. Staying flat-footed will make you slow and an easy target! Keep your knees slightly bent. The stronger straight punch using the back hand. This is most boxers’ power punch. This is a straight punch using the front hand. Often used as a set-up punch for the stronger backhand, to measure distance or in some rare cases as a power shot. The hook can be thrown by either hand and is executed by twisting the hips and shoulders quickly as your hand comes around to strike the side of the bag (or in your imagination, your opponent’s jaw). Discover more ways to improve your cardio fitness here. After six controversial years, the Affordable Care Act, aka Obamacare, may be on the way out, thanks to the GOP sweep of the presidency and both houses of Congress Tuesday. But promising to make the law go away, as President-elect Donald Trump did repeatedly, and actually figuring out how to do it, are two very different things. “Washington is much more complicated once you’re here than it appears to be from the outside,” said William Pierce, a consultant who served in both the George W. Bush Department of Health and Human Services and on Capitol Hill for Republicans. For example, a full repeal of the health law would require 60 votes in the Senate to overcome a filibuster. Given the small GOP majority in the Senate, “they would have to convince six or eight Democrats to come with them to repeal. That seems highly unlikely,” Pierce said. Republicans could—and likely would—be able to use a budget procedure to repeal broad swaths of the law. The “budget reconciliation” process would let Republicans pass a bill with only a majority vote and not allow opponents to use a filibuster to stop movement on the bill. But that budget process has its own set of byzantine rules, including one that requires that any changes made under reconciliation directly affect the federal budget: in other words, the measure must either cost or save money. That means “they can only repeal parts” of the law, said Pierce. Republicans have a ready-made plan if they want to use it. The budget bill they passed late last year would have repealed the expansions of Medicaid and subsidies that help low- and middle-income families purchase health insurance on the law’s marketplaces, among other things. President Barack Obama vetoed the measure early this year. That bill also included, as Vice President-Elect Mike Pence promised in a speech last week in Pennsylvania, “a transition period for those receiving subsidies to ensure that Americans don’t face disruption or hardship in their coverage.” The bill passed by the GOP Congress at the end of 2015 set that date at Dec. 31, 2017. Delaying the repeal date could work in Republicans’ favor, said Laszewski. “Then they’ll turn to the Democrats and say, ‘Work with us to replace it or be responsible for the explosion,’” he said. But Tim Westmoreland, a former House Democratic staffer who teaches at Georgetown Law School, said that strategy won’t work. “I don’t think people will see the Democrats as responsible if it all blows up,” he said. Meanwhile, Republicans have only the broadest outlines of what could replace the law. Trump’s campaign website has bullet-point proposals to allow health insurance sales across state lines and to expand health savings accounts—which allow consumers to save money, tax-free, that can be used only for health care expenses. House Republicans last summer offered up a slightly more detailed outline that includes creating “high-risk pools” for people with preexisting health conditions and turning the Medicaid program back to state control through a block-grant program. One possibility, according to William Hoagland, a former GOP Senate budget expert now at the Bipartisan Policy Center, a Washington-based think tank, is that Republicans could use the budget process to combine tax reform with health policy changes. “And a reconciliation bill that includes reforms in Obamacare and tax reform starts to become a negotiable package” that could attract both Republicans and potentially some Democrats, who are also interested in remaking tax policy. But if Congress does pass the GOP’s “repeal” before the “replace,” it needs to make sure that insurers will continue to offer coverage during the transition. “Are [Republicans] going to invite insurers in and listen?” said Rodney Whitlock, a former House and Senate Republican health staffer. If there is no acceptable transition plan, “insurers can say the same thing to the Republicans that they’ve been saying to Democrats,” said Whitlock, which is that they are leaving the market. And if that happens, he said, there might not be any insurers offering coverage for the transition. Imagine a sunflower that’s slightly blue. Or a stop sign that’s not red. These may be everyday sights for a person who's color blind—which means they perceive wavelengths of light differently than most people. “Color blindness is usually inherited,” says Jessica Lattman, MD, a New York City-based ophthalmologist. Several genes are needed to make the color-detecting molecules, or photopigments, in the cone-shaped cells of the retina (known as cone cells). Abnormalities in those genes can lead to difficulty seeing reds and greens, or blues and yellows—or in rare cases, an inability to see any color at all. “Because most forms of the disorder are linked to the X chromosome, [it] affects men far more commonly than women,” says Dr. Lattman. It's estimated that 8% of men and just 0.5% of women of Northern European descent have the common type, red-green blindness. To show how color blindness can affect a person's view of the world, the UK site Clinic Compare created the eight GIFs below. Each one portrays a different type of the disorder. Red-weakness—in which reds, oranges, and yellows appear greener and less bright—doesn't tend to interfere with a person's daily life. About 1% of men have this mild, X-linked type, according to the National Eye Institute. Also affecting about 1% of men, red-blindness means red appears back; and shades of orange, yellow, and green may register as yellow. Green-weakness is the most common form of color blindness, says Dr. Lattman. Five percent of men have it. To them, yellow and green appear redder; and blue and violet look the same. With this X-linked type affecting 1 in 100 men, greens appear beige; and reds look brownish-yellow. "Tritantomaly is very rare," says Dr. Lattman, "and it affects both men and women equally." A blue-weakness, this form of color blindness makes blue appear greener. It also makes it tough to differentiate yellow and red from pink. Blue-blindness is extremely rare, and also occurs in both men and women. People with tritanopia see blue as green; and yellow as violet or light grey. There are three types of photopigments—red, blue and green. But in people who have cone monochromacy, two of the three aren't functional. People with blue cone monochromacy (shown above) are often also near-sighted and have reduced sharpness in their vision, says Dr. Lattman. In people who have monochromacy, the most severe type of color blindness, none of the photopigments are functional. "These people see the world exclusively in black, white, and grey," Dr. Lattman says. They also tend to be very sensitive to bright light.